Peptides are one of the most buzzed about ingredients in anti-aging skincare. They’ve especially caught my attention recently ever since noticing results from the No 7 Line Correcting Booster. I’ve been wanting to add a moisturizer to my routine with this proclaimed line smoothing ingredient. 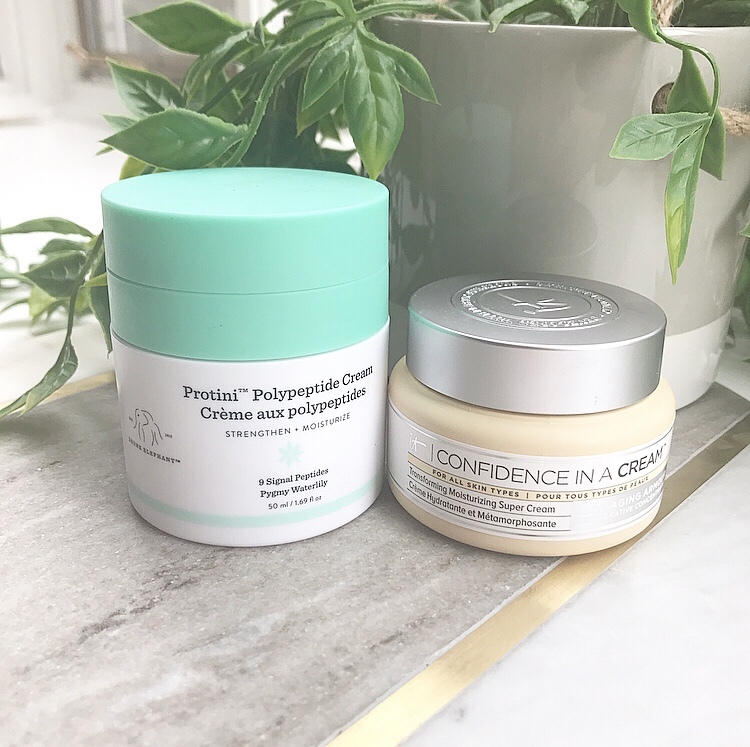 I picked up both the Drunk Elephant Protini and the It Cosmetics Confidence in a Cream-both containing different peptide blends. I used them each for a month and wanted to share my thoughts! They’re everywhere…serums, eye creams, essences, even body lotions, but do peptides actually work? What’s the science behind them? Let’s take a deeper look at this so called “fountain of youth” ingredient. Peptides are like the Legos of our skin chemistry. They are the chains of amino acids that makeup the components protein in our skin. Because they are fragments of a protein, they can stimulate more protein (like collagen) to be produced. This is where peptides role in anti-aging comes in. Collagen is a protein that contributes to the elasticity or “bounciness” of our skin. It can deplete over time because of age or environmental stressors like pollutants or sun exposure. Applying peptides to the skin is thought to to increase firmness, smooth texture, and increase hydration. There are 4 different types of peptides: signaling, carrier/copper, neurotransmitter, and enzyme modulating. Common terms you to look out for on an ingredient label are: anything ending in -peptide, beginning with, palmitoyl, Matrixyl, Syn-ake, Argireline, and GHK (a common copper peptide). So with so many different categories and long complicated names- which ones actually work? Well, it’s hard to say. Many studies have demonstrated their efficacy from subjects reporting their positive results. There have also been split face comparisons with a control moisturizer vs. a peptide moisturizer with wrinkle improvement. There have some in vitro, or petri dish, experiments where peptide application resulted with collagen production. We don’t know if these anti-aging results are a result of increased hydration, since peptides can act as a humectant. The only way to really test for collagen production is too look at the molecular makeup of a subjects skin which can be a tough task. While it’s hard to say if applying peptides directly to the skin increases firmness, I’m excited about the promising results. There’s also so much new, emerging research out there, I’m going to continue to give this ingredient a go. Let’s take a closer look at two moisturizers with these exciting ingredients! Cost: $68 for 1.69 oz. Details: A protein moisturizer that combines an unprecedented array and concentration of actives for improvement in the appearance of skin’s tone, texture, and firmness. , Coco-Caprylate/Caprate, Sodium Hyaluronate, Aspartic Acid, Linoleic Acid, Linolenic Acid, Lecithin, Butylene Glycol, Polyvinyl Alcohol, Sodium Lactate, Sodium PCA, PCA, Sorbitan Isostearate, Carbomer, Polysorbate 20, Polysorbate 60, Lactic Acid/Glycolic Acid Copolymer, Hydroxyethyl Acrylate/Sodium Acryloyldimethyl Taurate Copolymer, Xanthan Gum, Isomalt, 1,2-Hexanediol, Caprylyl Glycol, Chlorphenesin, Phenoxyethanol, Tocopherol, Sodium Benzoate, Phenylpropanol, Glyceryl Caprylate, Symphytum Officinale Callus Culture Extract. Ingredient highlights: Peptides are up there in the ingredient lineup (9 different ones!). There’s also some great hydrators like soybean, a humectant, that can increase brightness, and linoleic acid, a fatty acid that helps restore skin barrier. Waterlily (nymphaea alba root) contains antioxidants and can be soothing anti-inflammatory. There’s also a lactic and glycolic copolymer for some extra skin conditioning and some exfoliation. Thoughts: I’m really excited about the line smoothing results I got. The biggest difference I noticed was a plumping effect to the wrinkle above my left eye (see above). My face also felt noticeably tighter the next morning after use. It’s hard to say whether or not that tightening is from the firming effects of the peptides or maybe my skin was just craving more moisture from this cream. Any flakiness I had the night before, however, was smoothed and my texture was improved. This lightweight, gel cream took about 2 pumps to cover my face. I have a feeling I’m going to go through this pretty fast. It’s fast absorbing with no tackiness and no scent is detected. It took a decent amount of product to get the moisture level I needed, but each day I woke up with soft, plump skin. Cost: $48 for 2 oz. Details: An ultra-hydrating moisturizer that’s clinically tested to rejuvenate, repair, and restore skin for softer, smoother, younger-looking results. Developed with plastic surgeons—the leading experts in skin regeneration—Confidence in a Cream’s quick-absorbing formula transforms skin with each application by boosting its natural regenerative cycle for a more supple, healthier, younger-looking appearance. The proprietary anti-aging armour rejuvenating concentrate™ is activated upon contact to immerse skin in moisture and reduce the look of pores, discoloration, and key signs of aging. The exclusive concentrate combines collagen and hyaluronic acid to visibly plump fine lines and wrinkles, while niacin, peptides, a super ceramide complex, and other active ingredients smooth texture, intensely hydrate, and enhance firmness. Ingredient highlights: This moisturizer has a whooping list of ingredients. It covers the gamut of skin issues- whether you dry, oily, or acne there’s something targeted to your skin concerns. There’s some excellent moisturizers in here including aloe, coconut oil, shea butter, and sodium hyaluronate. There’s also skin smoothing ingredients including niacinamide, collagen, and ceramides. Peptides are further down here being the 45th on the list. Three are included. There are some potentially irritating oils including lavender, grapefruit, orange, and bergamont. They added colloidal oatmeal-maybe to counteract any sensitivities? I was a little hesitant after seeing this huge list, but my results surprised me! Thoughts: After 1 month of use, my skin has felt more hydrated and supple. The main noticeable result has been the smoothing effect to the line above the bridge of my nose. I think I said “wow!” out loud when I got a close look at these pics. I was also impressed by the increased smoothness underneath my left eye. Woo hoo! This cream has a thick, rich texture and a little bit goes a long way. I’m not a fan of the somewhat artificial smelling light fragrance, but it dissapates pretty quickly. With such a long ingredient list, there can be more potential for irritation, and it may be hard to pinpoint a specific ingredient if you do have a reaction. I did get two blemishes near my hairline when I first started using this, but no issues for the rest of the month. This could of been from the extremely occlusive nature of this cream or from an ingredient-not sure. Either way, I loved how dewy and smooth this made my skin. My skin has never felt so supple! In conclusion, it really comes down to skin type for me. I got line smoothing results from both of these creams but more hydration from It Cosmetics. I’m glad the breakout didn’t last, and the end results were worth it. I can’t get enough of that “lifted” feeling the Drunk Elephant gives my skin, but my dry skin craves a little bit more moisture. It sits well under makeup, and I can feel good about the DE ingredients being “sealed” underneath foundation all day. If you’re in the market for some skin firming and you’re oily or sensitive, go for the Drunk Elephant. For my dry skin friends, check out the It Cosmetics! Have your tried either of these? What’s your skin type? I’ll see you on YouTube at TheHonestBeautyReview! Foldvari M, Attah-Poku S, Hu J et al. . Palmitoyl derivatives of interferon alpha: potent for cutaneous delivery. J Pharm Sci 1998; 87: 1203–8. Robinson L, Fitzgerald N, Doughty D et al. Topical palmitoyl pentapeptide provides improvement in photoaged human facial skin. Int J Cosmet Sci 2005; 27:155–60. Katayama K, Armendariz-Borunda J, Raghow R. A pentapeptide from type I procollagen promotes extracellular matrix production. Journal of Biology;Chemistry. 1993; 268: 9941–4.